If you signed up to serve with Teach For America, the organization whose members serve two-year assignments at the head of classrooms in low-income communities, it’s likely fair to assume a couple of things about you: first, you believe that our society can and should work to close the educational equity gap, and second, you want to be one of the people working hard to do just that. Sound like you? It also sounds a lot like the students who choose to earn their master’s degrees through American University’s online School of Education. AU’s long political and social legacy extends to the present, with online graduate programs built around the idea that social change starts with teachers. 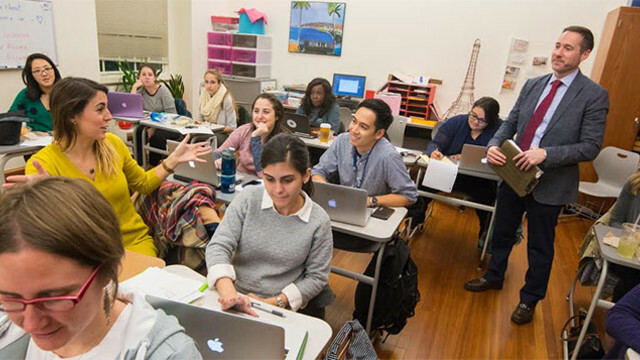 Our online School of Education offers three programs—a master of arts in teaching, a master of education in education policy and leadership, and a master of arts in special education—where you will learn clinically tested classroom approaches and pedagogical frameworks that will help you draw from and build on the belief in a better society that led you to join Teach For America. Read on for five ways you’ll be able to carry your TFA mission forward into your graduate studies, your career, and beyond. 1. You don’t have to give up your belief that the fight for a better society and against inequality can be waged from the classroom. At AU, you’ll never be admonished for the belief that social change starts with teachers; you’ll never be told that this conviction is naïve, misplaced, or impractical. We’ve built our programs’ curricula around this very belief. Our top-notch faculty consists of respected specialists and researchers who offer their graduate students innovative techniques that build on this belief. Our active partnerships with groups such as the Lab School of Washington—a pioneering, arts-based scholastic day school for students with learning disabilities—help us offer students opportunities for collaboration with other innovative institutions that share our social ideals. 2. Your TFA experience earns you a financial break. Because we want to attract the types of talented future teachers that TFA attracts, AU offers a tuition discount for TFA alums: the online master’s degree programs in American University’s School of Education come with a 29 percent tuition discount for TFA members and alumni. 3. You won’t have to move to study at AU. We know that it’s likely you picked up and moved to a new community to accept your assignment with TFA, and we commend you for that. We also know that you likely won’t want to move again once you’re resettled post-TFA. The flexible format of AU’s online School of Education programs means that you can stay in the place that makes sense for you and your life. Our students tend to be people who are active and deeply rooted in their communities—regardless of how long they’ve been there. We believe it’s important that teachers teach in the places where they’re rooted, so we’re committed to supporting you and your schedule to make that work. 4. You’ll still be able to apply your new skills through hands-on experience in a classroom near your home. It’s likely that while you were serving with Teach For America, some of your most important, most deeply felt, and most clearly remembered lessons came from your time at the front of the classroom. We value the importance of hands-on experience, and we’ll make sure you keep applying your skills in this context while you’re studying at AU. We work with high-quality schools and teachers in your area to help you find great student-teaching opportunities and internships. 5. You can build on the five-week intensive training that TFA offered before you got started. If you worked with Teach For America, you started your TFA assignment after a brief and intense five-week summer training, and then continued on to your classroom assignment right away, where you surely learned much more. We’ve found that many students feel that a graduate program is the natural next step to synthesize, expand upon, and discuss what they’ve learned from their TFA experiences and challenges. AU’s natural alignment with the TFA mission makes it an obvious choice for many of the program’s alums. You don’t have to set aside the hopefulness and idealism that attracted you to TFA once you leave that program. There are other programs waiting for you at American University where you can develop your knowledge and skills and give that idealism an edge so that you can use it to find the career that’s just right for the post-TFA you.